Bring 8 cups of salted water to a rolling boil in a large pot. Cook the orecchiette according to package directions. Place the zucchini in a large serving bowl. 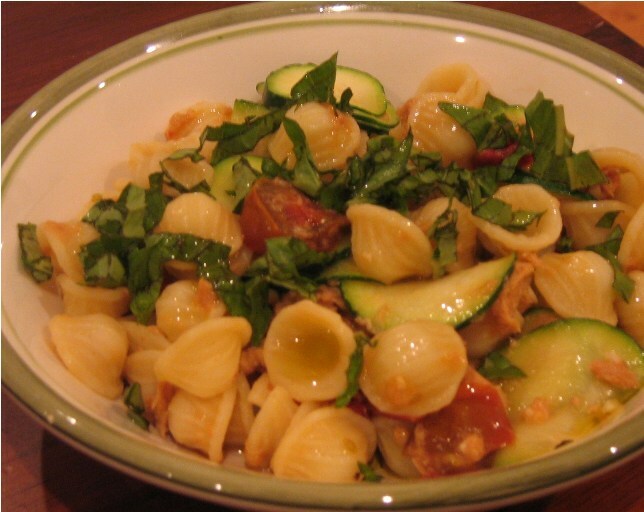 Drain the pasta over the bowl, and let the zucchini stand in hot cooking water 2 minutes to soften. Drain, and return zucchini to bowl. Melt the butter (or heat the 1 tablespoon oil) in a large skillet. Sauté the garlic and tomatoes over medium heat until softened. Remove from heat. Add the tuna. Toss with the pasta and zucchini, and drizzle the oil over all. Season with salt and pepper to taste, and sprinkle with the basil. Serve immediately.